BG Europa (UK) Ltd. 600m² warehouse stocks a large inventory of spare parts for immediate despatch. Located in Suffolk the stores are within easy access to the port of Felixstowe and the network of London airports. Routine pallet and parcel carrier collections in conjunction with same day courier operations ensure the ability to meet the needs of customers expeditiously and offer on-time deliveries almost anywhere in the world. BG Europa (UK) Ltd supply genuine Barber Greene Asphalt Plant Spare Parts for all plants manufactured by Barber Greene (England) Ltd. Spare parts are manufactured to original Barber Greene specification and although they may look like standard market items they can be manufactured to special tolerances, have special alloys or special heat treating. Consequently serious problems arise when these facts are not realised and such parts are substituted unknowingly. Our policy of stocking two machine sets of wearing parts including liner plates, paddle arms, paddle tips, seals, bearings, gears and pinions aims to ensure that the required part is available when required. Our comprehensive records enable us to identify the parts you require from original Barber Greene engineering files. When customers are performing major refurbishment work; for example relining a pugmill mixer, BG Europa (UK) Ltd can supply stock parts on a sale or return basis ensuring all parts are available if needed during the work. Our workshops offer a refurbishment service for major components such as pugmill gearboxes, screen drive units and screen bodies to original Barber Greene specification using genuine spare parts. BG Europa (UK) Ltd supply genuine Astec spare parts for plants manufactured by Astec. 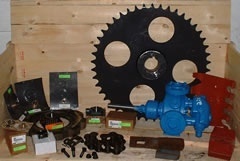 Stocked parts include drag chain, liners, shanks, tips and electrical components. Regular imports from the USA to our UK warehouse provide parts that are in free circulation within in the EU allowing expedient distribution within Europe. In addition familiarity with export procedures ensures efficient timely distribution to The Middle East and Africa. BG Europa (UK) Ltd supply genuine FMA Ullrich spare parts for all plants manufactured by FMA Ullrich. BG Europa (UK) Ltd supply genuine Soter spare parts for the Soter Foamed Bitumen system. Stocked parts include nozzles, injectors, foam chambers, meters, gauges and pumps.